I know that starting a blog can be confusing, it can be intimidating. But you can be sure that this guide will help you get past all the steps required to start a blog. In the past, to start blogging, you had to learn coding and programming, and lots of other technical stuff. But nowadays, in 2015 getting a blog started is easy. You could say that the process of setting up a blog is almost automatic. It doesn’t matter if you are 13, 31, or 81 years old. It doesn’t matter if you have a degree or what you do for a living. If you want to setup a blog, this tutorial I will show you how. Just follow this step-by-step tutorial for beginners and you will find it easy to setup a blog. Don’t forget to bookmark this page so you can come back anytime you need. Press Ctrl+D in Windows or Command +D if you are on a Mac to bookmark this page now. My name is Oscar Gonzalez and I am a web developer, and all around techie. I help people in all walks of life start up and run blogs and websites. I created this guide to help you start a blog. Once your blog is setup, you can read through my blogging tutorials and articles to teach you how to blog. I constantly update that section and add new ones to keep you ahead of the game. This is the beginning, today, right now is the first day of the rest of your journey. Don’t be afraid. You’re in good hands. If you aren’t sure you should start a blog, take a look at this article I wrote about it: 10 Reasons why you should start your own blog in 2015. Oh and before we get started, if you EVER feel like you’re stuck, or have trouble setting up your blog, get in touch with me and I will help you out. Let’s get started. What follows next is a step by step guide to get your blog up and running quickly. Here’s what to expect next. I also made a copy of this available for download in PDF format. You’ll see a box below that lets you download it. (1) Decide what you will blog about first. In this short section, we’ll talk a little bit about blog topics. I will give you some ideas if you’re stuck. (2) Decide what type of blog you’re going to use. (3) Selecting a domain and setting up your blog with your own domain. This is the very first thing you need to do. Decide what you want to blog about, you need to select a blog topic –some people call it a niche. You can think about your blog topic by deciding if there’s something you really like. Is there something you’re really interested in? Something you’re really, really passionate about? If there is, then that you can start a blog about that! My first and current blog were really just about my life, interesting things I found online and some of the stuff I was doing online. If there’s something you always tell people about, stuff you are always talking about, then that is a good indication that it should be your blog topic. It is difficult starting a blog about a topic that doesn’t interest you. I don’t recommend trying to start a blog if you’re not interested in the particular topic because you can get tired of it really fast. It is a lot easier to write about something that you’re passionate about. If you have a lot of experience in something, like a specific type of job, or industry, or niche then that is also a good topic because you are an expert — that’s a good thing! If you are still stuck coming up with a topic, think about what you do in any given week. What do you like to spend time on? Do you have a hobby? Do you have something you do daily? A ritual that you can’t live without? Think about those things and you’ll find a topic there; or you can blog about everything I just mentioned. In the next section, I give you some ideas you can explore when selecting your topic. If you have already decided your blog topic, or topics, then you can skip this part and jump to section 2, What type of blog should you use? Lifestyle blog. You can write about a particular type of lifestyle. People love finding other people that live the way they like to live. People live vicariously through others, so no matter what type of lifestyle you pick, you’ll garner an audience by sharing stuff about it through your blog. Entertainment blog. You can blog about popular culture. Movies, music, theatre and other forms of arts can be topics to blog about that will be successful. If you narrow it down a bit, you can do a blog about movie reviews, celebrity news, latest television shows. These topics have always been popular and will continue to be popular in 2015 and beyond. Religion blog. Blogs about religion are sprouting up everywhere because people feel strongly about their faith. There’s almost an endless supply of things you can talk about with a religion blog. You can talk about one specific religion, you can talk about all the faiths of the world, traditions, practices, people. Personal blog. This can be a fairly easy blog to start because it really is about you. You are an expert about you, right? You can talk about your personal journey through life. You can share your views, opinions and thoughts on almost anything you want by doing a personal blog. You will find that sharing personal stories can help a lot of people that could be struggling with things you have already figured out. Political blog. If you are into politics, this is another popular topic that you could write about. This is a topic that should never run out of ideas because you can cover political topics at so many levels, financial, global, national, cultural, the ideas never end and politics are always changing. If you like this kind of thing, this can be the best blog topic to cover when you start. Foodie blog. If you love food and want to share your culinary adventures with the world, this might be perfect for you. It doesn’t matter if you cook or just enjoy eating, people love looking at photos of great food and hearing about different dishes, recipes, kitchen gadgets and the latest hip restaurant. Fashion blog. – If you are into fashion trends, then this might be the blog for you. You can cover seasonal lookbooks, the latest trends in outfits, shoes, accessories and more. People always want to see what people are wearing and if this is something you’re passionate about then you should give it a try. A few other types of blogs are also popular and could be perfect for you: Health and wellness, fitness, financial and the Do It Yourself (DIY) type of blogs. These are informative type of blogs and they attract a great audience. 2) What Type of Blog Should You Use? Free Hosted or Self-Hosted? 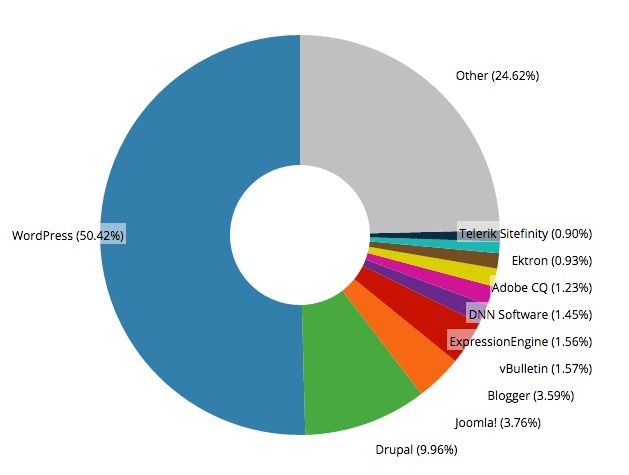 Did you know that WordPress is the most popular blogging platform? As of the time of this writing, it has been downloaded over 80 million times. WordPress is used by some of the most popular blogs and websites. You can choose from a virtually unlimited number of layouts and free themes. You can write blog posts easily and add images, video or other content. You can categorize your posts and easily create custom tabs. People can easily comment and share your blog. You can use your blog to earn extra income. It looks good on a mobile device. You can start a blog for free right now. But in exchange for that free service you will be giving up a few things. When you use one of these free hosted platforms, you don’t get your OWN domain. Usually you will be assigned a sub-domain, so instead of having something like myownblog.com, you’ll get something like myownblog.blogger.com, that’s clumsy and awkward. Free blogging platforms have very limited customization and additional options. This means your blog may look pretty plain, boring and you will have a hard time making it do anything interesting. If you want to add a custom module, or a shopping cart, or a photo gallery you may not be able to do it at all. Some of these free platforms can be enhanced with additional paid modules, but these “extras” cost a lot of money so at the end, the promise of free falls short when it comes to flexibility and design. You don’t own your blog when it’s free. When you get your blog for free someone else is hosting it and because of this, you don’t have full control over it. The owner of the platform has control; they set the rules and control the message. That means they control the policies and regulate what gets published. They can block your blog, they can remove it altogether and you have no recourse. All the work you do on your blog could be gone overnight because you made a mistake, or the website owner or its policies don’t agree with your content. If you don’t have any money and don’t think that you’ll blog for more than a couple of months then you could start with a free blog; that is a possibility but I don’t recommend it. My recommendation is to use a self-hosted blog with your OWN domain. That configuration gives you complete control over your blog and with your own domain like myownblog.com it will look more professional. This is the best option for people that want to blog for the long-term, to share expertise and knowledge and to become a real blogger and even earn money from blogging. How much does it cost to start a self-hosted blog on your own domain? It doesn’t cost a lot. You need 2 things. You need a domain, which costs around $8 to $12 per year and you need web hosting, which costs about $4 per month. Web Hosting is how you connect your blog to the web so people can visit it. Altogether, you can start the blog for about $60 to $70 per year. And of course, there’s a little bit of your time to get things going. Before you worry too much about the cost, one thing to consider is that if you aren’t totally committed to blogging and decide that it isn’t something you want to do then you can stop at anytime. Many web hosting services have 30-day money back guarantees. 3) Selecting a Domain and Setting up the Blog. To obtain a domain, you need to register it as yours through a type of company called a registrar. Registering a domain is very simple. You can use a company like Godaddy, or Namecheap to register your domain. But don’t go to buy your domain just yet. In a moment I’ll explain how to get the domain for your blog for free. The trickiest part of this will be coming up with a good domain. 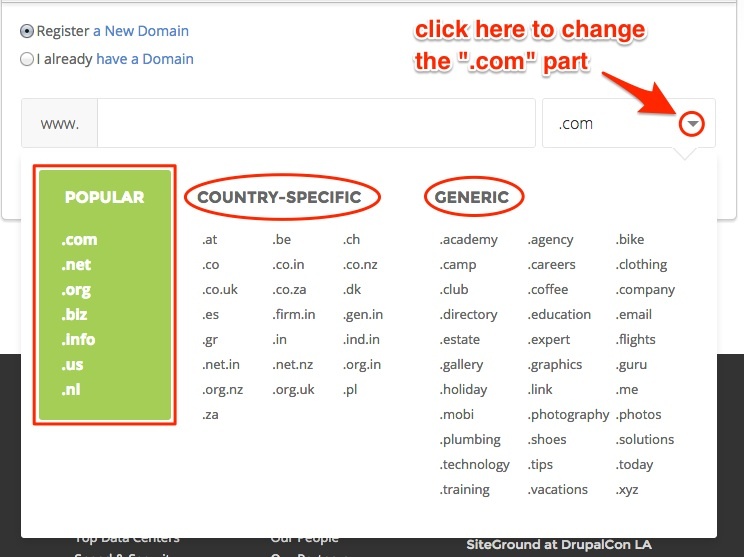 Your domain should be easy to pronounce, try to avoid confusing or ambiguous characters. For example, the letter “L” can be easily confused with an “i” or a “1” in some situations. Try to think of a name that is memorable and descriptive of what you want to blog about. If your blog will be personal, the domain name could be your own name. Keep in mind that the exact name you want could be taken by someone else, so before you take the next step come up with a list of names you like and a few variations. A shorter domain is better than a longer one. Should be easy to pronounce and easy to spell. Clever names need more promotion than descriptive names. Don’t use a tool or special search box to see if your domain is taken. Try to use a keyword about your topic in the domain name. Avoid characters that can be confused. Try to pick a .com, .net, .org. These are the most popular and are received better by your audience. You may review this blogpost that talks about how to test if the domain name you want is available. I have used most of the most popular webhosts out there for my own blogs and for the blogs and websites of my clients so I can tell you which ones are good and which ones I recommend. There are many web hosts out there, but they’re not all the same. The main things you want to look for in a web host is high quality, outstanding support and that they support WordPress. I have used this host for many of my sites and client sites and I highly recommend it. They will take great care of you.Siteground. They pride themselves in providing outstanding customer support and they provide services geared toward WordPress. Siteground provides a money-back guarantee if you are not satisfied with their services and have a great number of perks that will help you in the long run. Another great thing about using Siteground is that when you follow my guide, they will give you a domain for free! just follow the links in this guide to get the 60-70% off discount and the free domain. Follow one of my links to Siteground WordPress Hosting. During the purchase process, you will notice that you can get a domain at no additional charge; it is included for free. 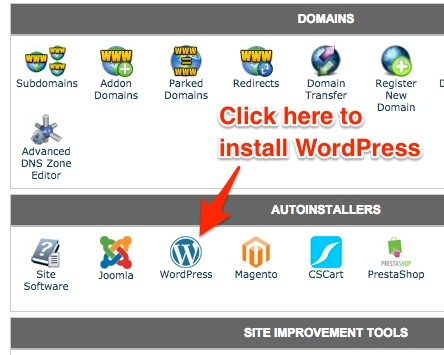 After you buy your hosting account and get your domain, you have two basic ways you can install WordPress. 1) Using the one-click installation system (easy). 2) Installing WordPress by hand (advanced). The first option is the best one for beginners because it saves you all the steps and the blog gets installed almost automatically just by answering a few simple questions, then you’re ready to start blogging. I have outlined two guides next; one for Siteground easy one-click install, and one if you want to install WordPress by hand. You may be curious to know the difference between the two options and I think it’s wise you understand them before you move forward. Option one, using the one-click installation program. The one-click installation is a system offered by many web hosts. It allows you to quickly get WordPress installed without any technical knowledge or expertise. You simply find the one-click install program in your web host account dashboard, fill in the details for your blog and then let the web host install the blog for you. The result is that you get a link to your blog’s administration page, a username and a password. Then when you login, you are ready to start using your blog. It is very easy to use this and get started quickly. But if you want to learn a little more about how your blog works and the different components that make WordPress work, then the manual installation is recommended. Option two, installing WordPress by hand. 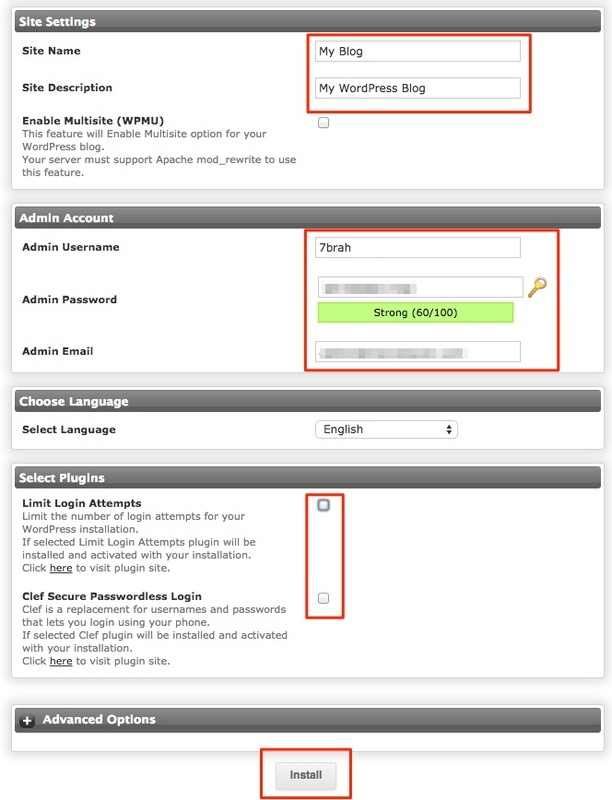 Installing WordPress by hand is relatively simple, but you need to follow the steps carefully. 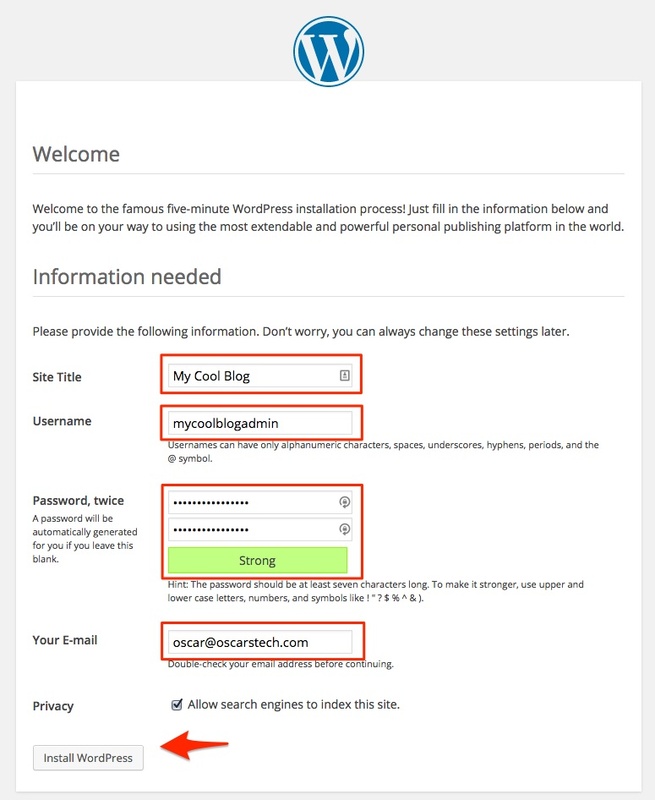 WordPress.org offers the installation steps as a simple five-minute task. If everything goes according to plan, it should take you five minutes or less to install your blog and get up and running, but if you make a mistake or something isn’t clear then you could spend a long time trying to figure it out. You may even have to call your web-host to help you get things back on track. The benefit of installing WordPress by hand is that you will learn at least the basics of the components of your blog. 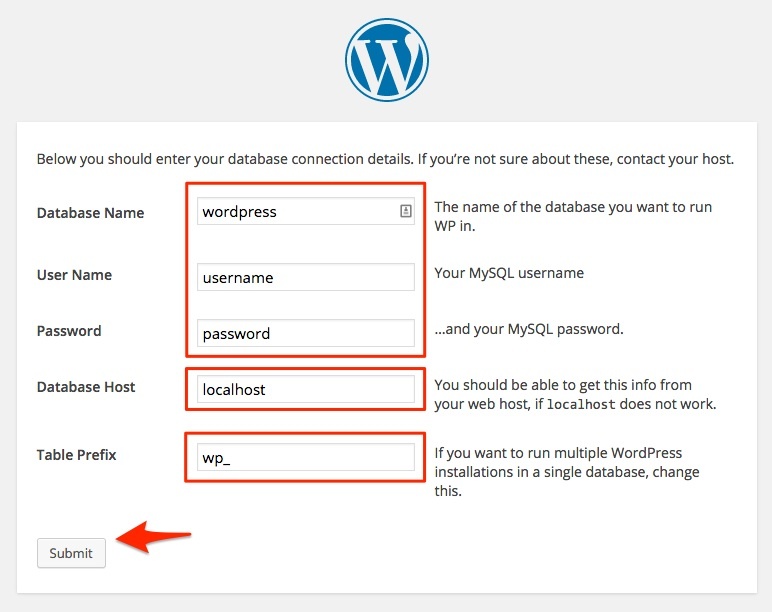 You need to setup a database, you’ll need to get the WordPress program from WordPress.org and then install it or upload it to your new web host account. The installtion of your blog using Siteground is easy and should take you about 10 minutes. I have included steps that show you how to get your account, then how to install your blog using WordPress. Before you get started with Siteground, make sure you use this link to visit Siteground and the free domain and 60% discount will automatically be applied to your purchase. When you follow my guide, you will be able to get the best price. Click on the link below to expand the guide and continue installing your blog. 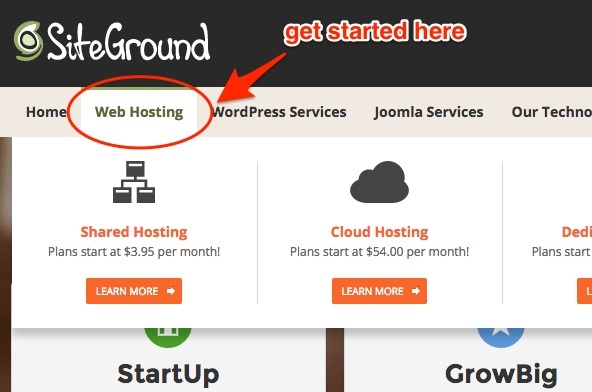 Visit Siteground and click on the “Web Hosting” menu item. Click on Web Hosting to start. More options are explained below. All three plans offer high speed, security and enough space. If you are on a budget and only want to start one blog, you probably want to use the StartUp plan. The other two plans, offer additional premium features like longer backup retention, SSL certificates, additional space and the ability to run multiple blogs or websites. If you start with the StartUp plan and later your blog gets big, or you want to add an ecommerce section, you can always upgrade to the next level. 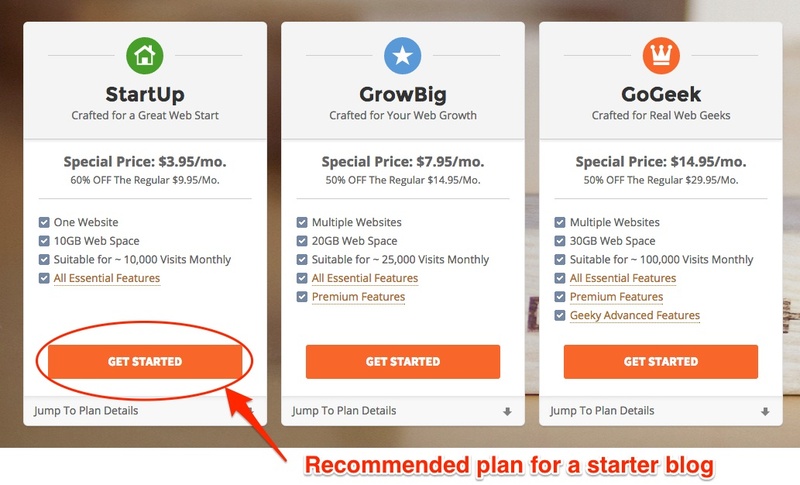 Once you select a plan level, you can choose your new domain for your blog. Follow the tips I gave you earlier about choosing your domain and type the domain you want in there. 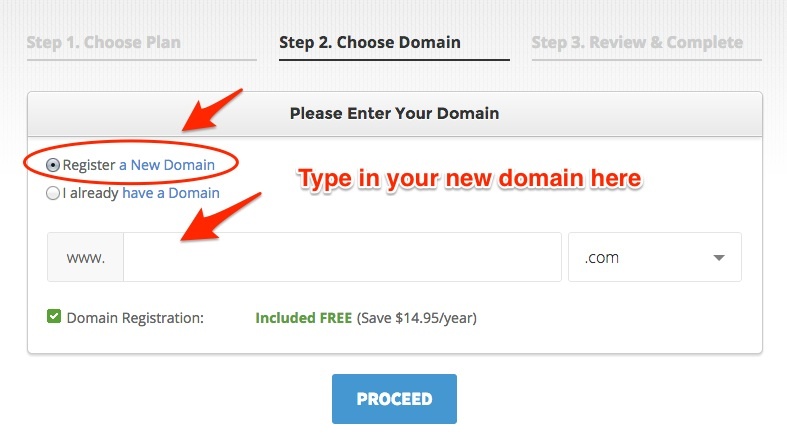 Select the New Domain option and type in the desired domain here. If you already have a domain because you bought it somewhere else, or you have had it for some time, then use the other option “I already have a Domain” and type in your domain. Fill in the contact information details in the first section of the form. Every field except Company is required. Fill these in accurately, these are used only to contact you regading your account. The next section asks you for a password. You are free to come up with your own password. Make sure it’s a password that other people will not be able to guess and make sure you can remember it; for now you could write it down. You need to enter the same password twice. We’re going to need this password to get your blog installed in in just a few minutes so don’t forget it. Enter the same password twice and don’t forget it. The last section of the form is the payment details. Something to notice is that Siteground only accepts Visa or Mastercard for your payment so have your card handy for this step. Fill out the standard payment information. Visa or Mastercard only. Note the option in the bottom about the billing address. If your address for your credit card is different than the address you used in your contact details before, you’ll need to uncheck this box and fill in the details. The last section is the Purchase Information. Review your options, then make sure that you agree to the SiteGround Terms of Service and then click on Submit Order to complete your order. If all went well, your account will be setup within a minute or two of completing your order. WooHoo. Pat yourself in the back! You are Ready to install WordPress! To install your blog using WordPress in your new Siteground account, you’ll need to sign in to your Siteground account. You can login with the password you created earlier during your account purchase. Use this link to login to your Siteground account. Your username should have been displayed when you completed the purchase, but it has also been emailed to you for reference. When you first access cPanel, you’ll get a message like the one below, I recommend you use the “Access cPanel Securely” option. Alert about secure access to cPanel. From the cPanel dashboard, you need to click on the big WordPress icon near the top of the list of apps and scripts; it is listed under the Autoinstallers section. 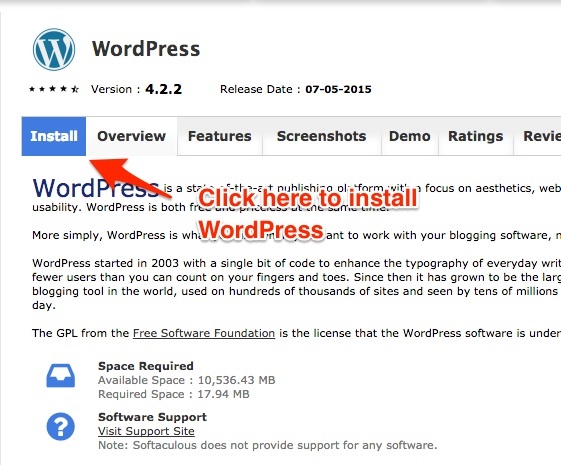 On the next screen, you can read a little more about WordPress or click Install to complete the installation. Click the Install tab. Click the Install tab to fill in the details and complete the installation. On the next screen, you will select the options for your WordPress blog. You can and should leave most options with the defaults. Choose Domain, should be selected to the domain you used during your registration. In Directory, you should leave it blank unless you have a specific reason to install your blog in a sub-folder (not recommended). I recommend you leave this blank. Databse Name, leave the default that is filled in. Under Database Settings, leave the Table Prefix the way it is. The next section takes care of the Site Settings. These settings include your Blog name and your Blog’s description. Fill the “Site Name” and “Site Description” to change these. If you aren’t sure what to fill in here, leave it the way it is and you can change it later. Under Admin Account, Siteground will have created a unique Admin Username, and Admin Password. Thes username and admin password have been filled out at random just for you so they are unique and safe. Copy and paste them somewhere safe so you can use them to login to your blog when you finish the installation. These are your WordPress login credentials. If you want to change the email address, you can use another email address of your choice. This is where your WordPress blog will send any administrative notifications, like updates and password reset emails. Under the Select Plugins section, uncheck the “Limit Login Attempts” option and leave the “Clef Secure Passwordless Login” option unchecked. These can add unecessary complications to your blog for now. Leave the Advanced Options alone and click on the Install button at the bottom. After a few moments, you should see your blog installation complete. 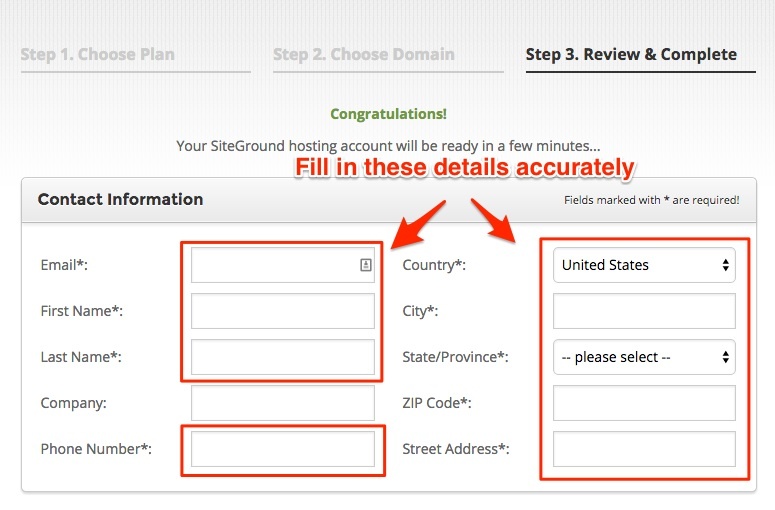 Siteground will give you a confirmation message along with your administrative address to login to WordPress. You can now login to your WordPress blog! You’ll need your WordPress credentials to login. These are the Admin username and Admin Password that Siteground gave you during the last step of the installation process. If you decide to use a different company for your web hosting account, or if you want to install your blog by hand then you want to follow this guide. Traditionally, you need an FTP program to install WordPress by hand, but with this guide you will not need to use an FTP program like Filezilla, Cyberduck or SmartFTP. Instead of using FTP, you will use the built-in system provided by your web hosting account to install your WordPress blog. The web hosting account also needs cPanel for this guide to work. If you need a web hosting account for your blog and you don’t want to use Inmotion Hosting or Siteground hosting, you may want to review my list of other recommended web hosts for WordPress. Use whatever administrative dashboard to login to your web hosting account. You should have been provided a link, username and password to access your account. If you can’t find this, please contact your web hosting support and ask them for your cPanel login information. 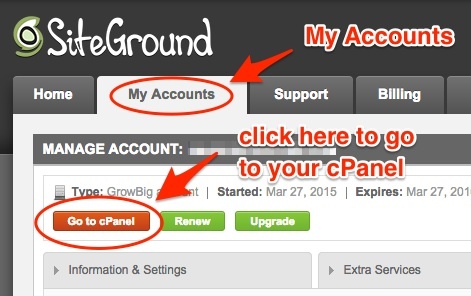 Somewhere in your account, you should have a link to open your cPanel control dashboard. Look for this link and click on it. Once you are in the cPanel dashboard, you need to find the button labeled phpMyAdmin. This is the easy way of creating a database for your WordPress blog. Click on that to get started. Creating the database. The first step in creating the database is to come up with a database name. Each web host could be slighltly different so yours may look a little different than the screenshots I have here. 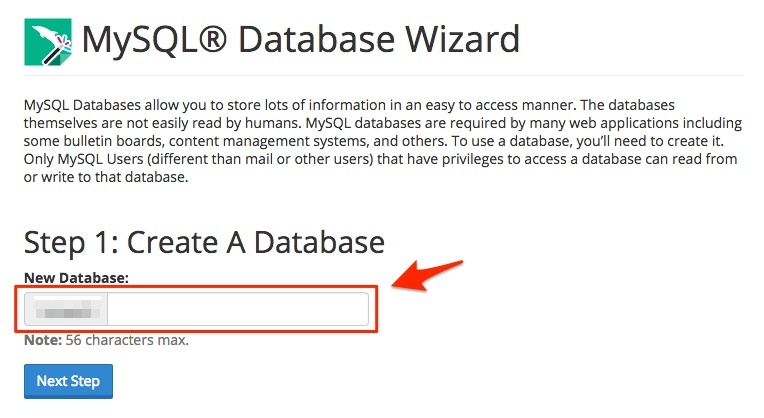 Notice the requirements for your database name. For example in this screenshot it shows that the database name can be up to 56 characters long. Sometimes there are other restrictions like no special characters or no numbers. Come up with a name and fill it in. When you fill in the name, click on the “Next Step” or “continue” button. Fill in the name for your database. Come up with your own name. Creating a database username. 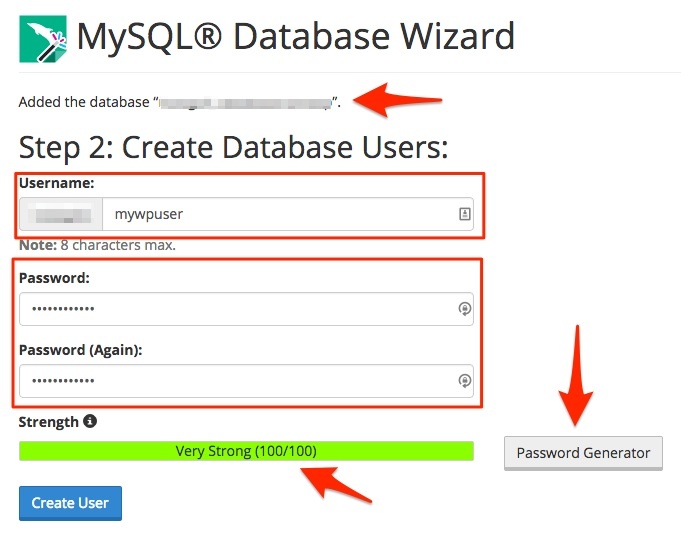 The next step after you name your database is to create a database username. Notice a the top, you’ll see that you have Added a database, the database name you came up with should be displayed up there. Then you create the username. 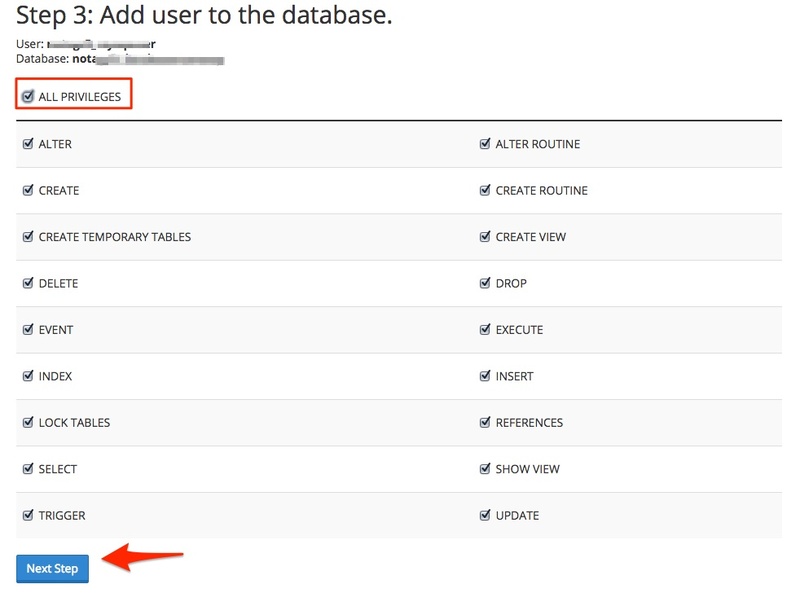 In a similar way to how you created the database, you’ll come up with your own username. Notice that there are limitations for this name as well. The password generator is suggested to get a secure password. 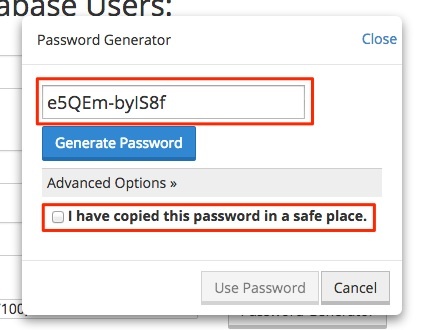 When you have filled in the username and password, make sure you save the username and password on a file like I recommended earlier, then click on Create User to move to the next step. You should see a confirmation that you created a username and will be presented with the last step during the Database Wizard. Now we’re going to assign permissions so the username you created can access the database created earlier. You will notice a lot of checkboxes here, just use the very first checkbox that says “All Privileges” and all the other checkboxes should get automatically filled in. Make sure all the privileges in the database have been checked. The last step of the database creation process should show you that you created the database successfully. You’ll be presented with the username and database name, some hosts will also show you the password, but you should have saved it already. Click on the “Go back home” or “back to cPanel” link, if you don’t see those links, make your way back to the cPanel before you move to the next step. 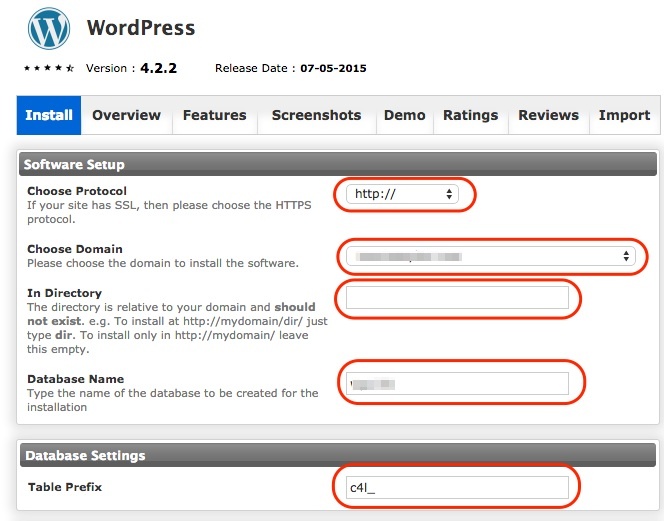 Now that your database is created, we can download the WordPress software and install it on your hosting account. Visit http://wordpress.org/download and download the latest version of the WordPress software. 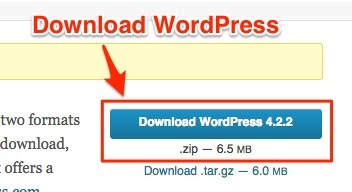 Download the WordPress zip file to your computer. Go back to your cPanel dashboard and look for the File Manager app, it should be under a section titled: Files as shown in this screenshot. When you open the File Manager, you’ll be asked which folder you want to open. 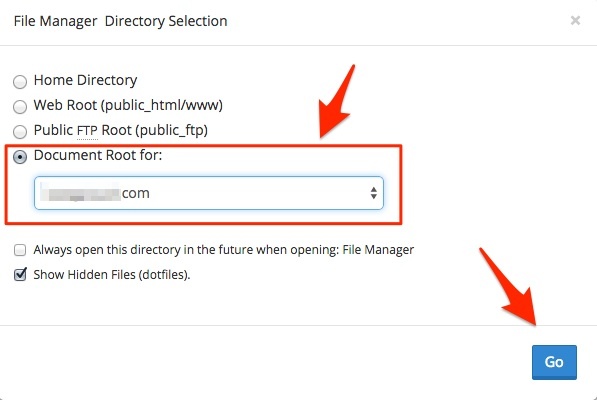 You must select “Document Root for:” and make sure your domain is selected in the dropdown box. Select the Document Root that shows your correct domain then click go. From the File Manager, on the top you should find a button labeled Upload, click on this and a new window should come up. The Upload button may look different in your own web host. You should be presented with the File Upload window. 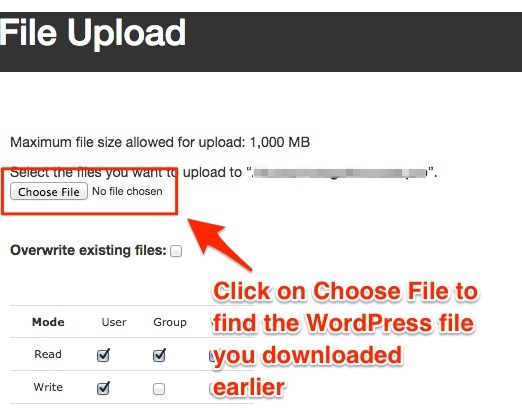 Click on the “Choose File” button and find the WordPress file you downloaded earlier. The WordPress file should be named wordpress-x.x.x.zip where the “x.x.x” represent the latest version of the software, eg wordpress-4.2.2.zip. Click on open or ok to upload the file. When you upload the file, the File Upload manager should show a progress bar as the file gets uploaded. Wait until it says “complete” and then click on the bottom link to go back to the file manager. 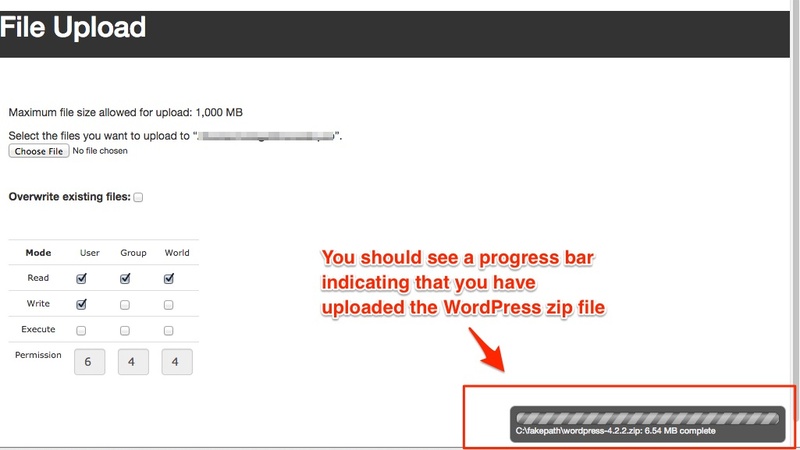 The File Manager should show you the WordPress zip file now. If you don’t see the WordPress file, try clicking the reload button (see screenshot above). If you still don’t see the file, make sure you follow the follow the upload files correctly and try again. 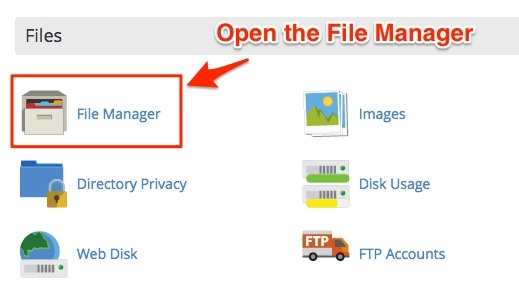 Once you see the WordPress zip file in the File Manager, click on it once to select the file. Once you do this, the “Extract” button on the top (near the Upload button) should become available. Click on Extract. 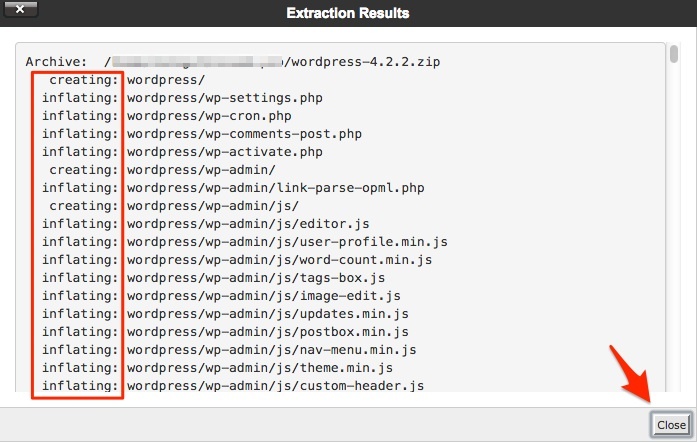 You must select the WordPress file before it can be extracted. This will pop-up a new message confirming your action. 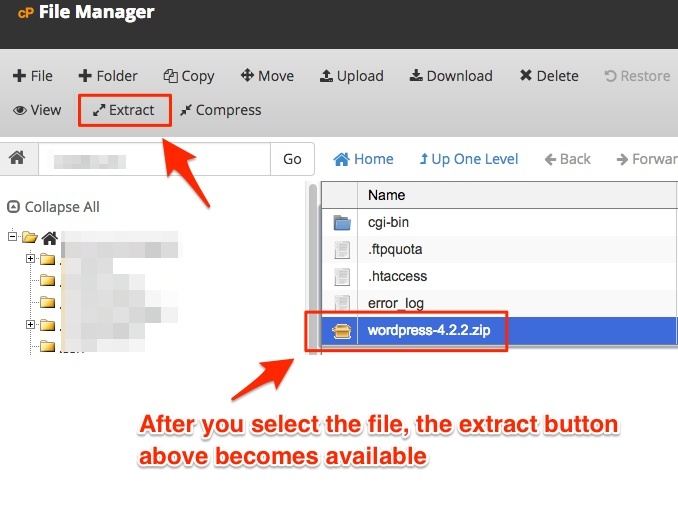 You should see the WordPress zip file indicated at the top and then the folder where it will be extracted to, leave everything as is and click the “Extract Files(s)” button. 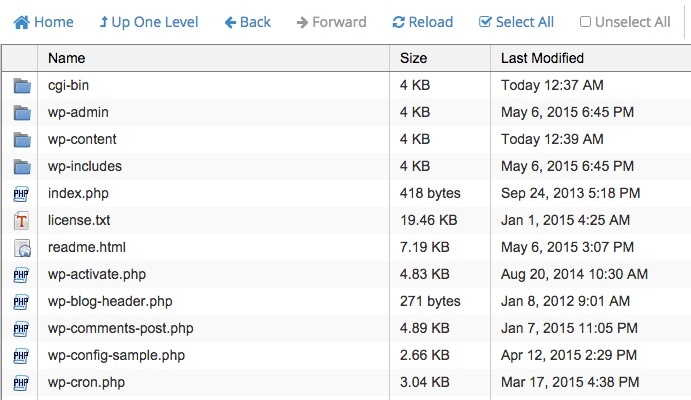 The WordPress zip file will be extracted quickly and you should see something like this. Click the close button and this should bring you back to the File Manager where you will see the original WordPress zip file and a new folder named “wordpress.” Double-click the new wordpress folder to go into it. 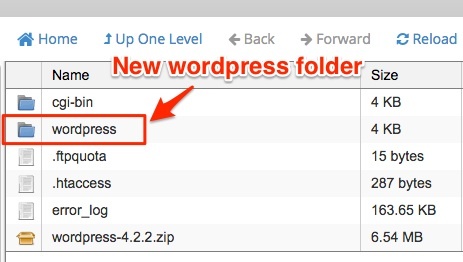 Find the wordpress folder and go into it by double-clicking its icon. Once inside the WordPress folder, click on the “Select All” button; this will highlight all files and folders in the WordPress directory and enable the “Move” button. 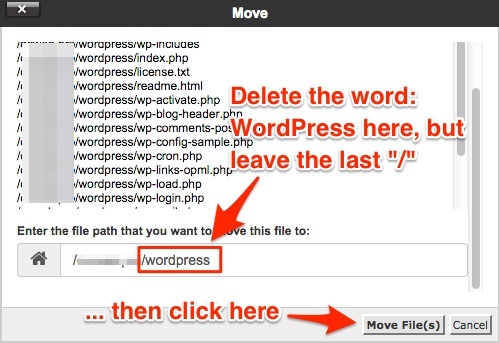 Delete the word “wordpress” where it says to Enter the file path. You should quickly see all the files disappear, and then will be taken back to the File Manager and the directory should now be empty. This is expected because you are in the “wordpress” folder, but we have just moved all the files and folders to the main folder. Close this window, then go back to the cPanel dashboard and click on File Manger again. When you open the File Manager, you’ll be asked (again) which folder you want to open. You must select “Document Root for:” and make sure your domain is selected in the dropdown box. Your directory may look a little different. This screenshot is missing some files to keep it shorter. You can now close the cPanel windows. First, take a deep breath, you’re almost done! Also congratulate yourself for this part was the toughest. In fact if any of the next steps do not work as listed, chances are something didn’t quite work in a previous step. Type the URL (your domain) into the address directly. 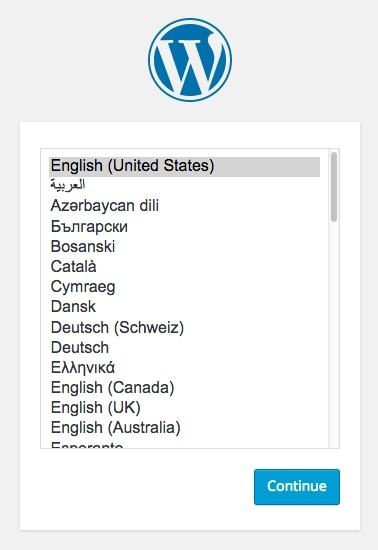 If everything worked correctly, you should see the WordPress configuration screen, select your preferred language. For this guide, we’re using English, select it and click Continue. You need to fill in the details on the next screen. Database name, user name, and the database username password as mentioned before, you should have this info saved. Fill it in verbatim, copy and paste it carefully into each field and make sure there are no leading or trailing spaces (blank spaces). There are two additional fields, the Databse Host and the Table Prefix. Most of the web hosts out there use the name “localhost” for your Database Host so you should not need to change it. For Table Prefix, it is recommended that you change it a little bit. On the next screen, you just have to click “Run the install” button and WordPress will then be installed. You now need to fill in some details about your blog and create your administrative credentials. This is the fun part. Give your blog a title by filling in the “Site Title,” if you aren’t sure what to fill in here, you can fill in “Site Title” for now and change it later. Create a username, this will be your main blog username. Do not make this username “admin” make it something unique like the one shown in the screenshot. Come up with a password that is strong and safe and make sure you keep it safe for now, you’ll need it to start using your new blog. Enter your e-mail. 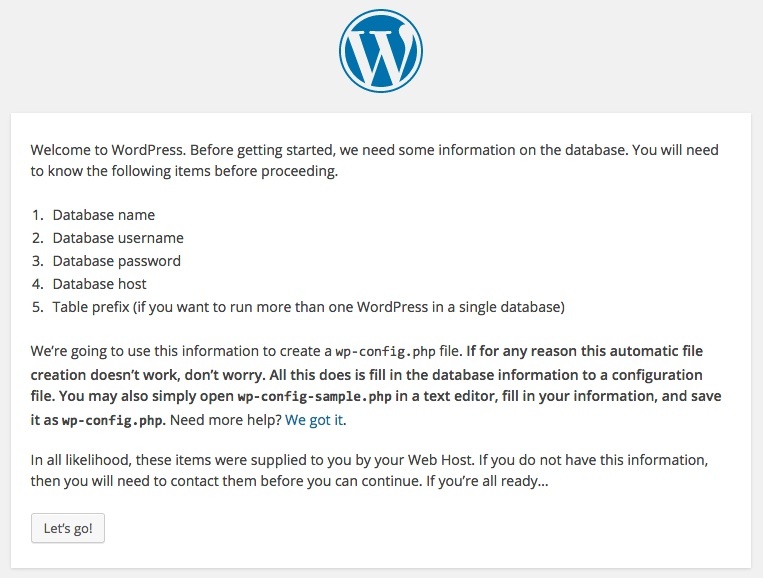 This is the e-mail that WordPress will use to send you notices, alerts and reset your password if you forget it. For Privacy, you should keep this box unchecked for now. This will give you sometime to get some blogpost and content on your blog before you get your site listed in the search engines. When you have filled out all the details, click on “Install WordPress” to finish the installation. Fill in the details for your blog, create your username and password. If all went well, you should see a Success! confirmation page. 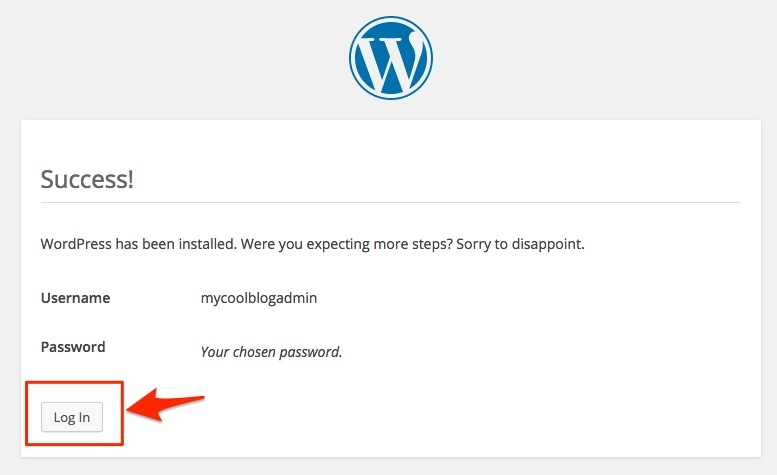 Click the “Log in” button to log in to your new WordPress blog! Success! You installed WordPress and are ready to blog now. When you click on the Log In window you can enter your Username and Password from the previous steps. You are now ready to blog! Now that your blog is installed and you have logged in, you can start blogging! Next I show you a few steps to get your first blogpost published and ready to go. 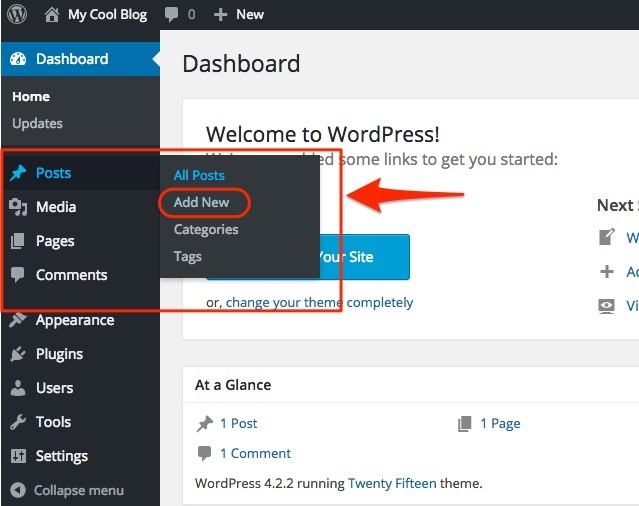 When you first log into your blog, you will be presented with your WordPress dashboard. From the WordPress dashboard, look for the posts section on the left and click on the “Add New” post. This will bring up the new post window for you to write your first blogpost. Add a new blogpost to your new WordPress blog. You can then type in your blogpost. 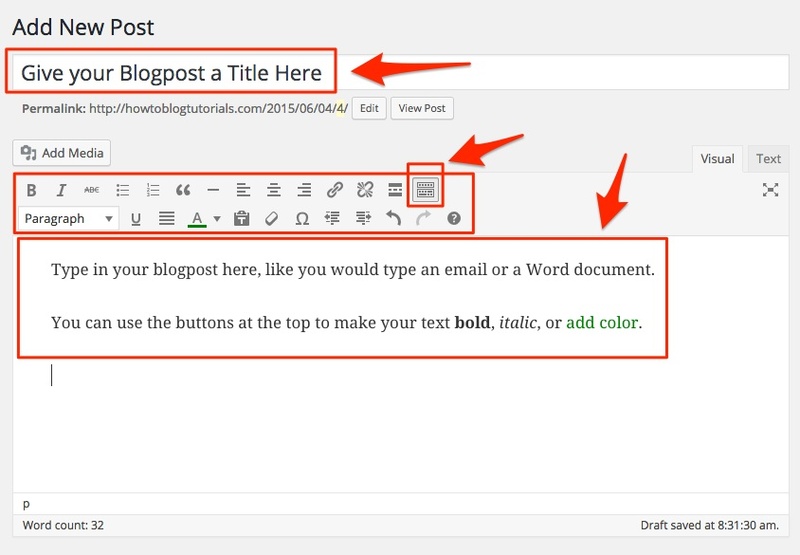 Write the text you want to add to your blogpost. It will feel a lot like writing an email or a Word document. You can make the text bold, italic, underline it or add color to it. If you don’t see all the icons that are shown in the screenshot below, click on the “Toggle Toolbar” button that is highlighted to display them. When you’re ready, give your first blogpost a title, add some text and you’re ready to publish! When you are comfortable with your first blogpost, on the right hand side you’ll find the publishing box. This section allows you to publish the blogpost for others to see, or save it as a draft. You can also schedule it so it remains unpublished until a date you set in the future. There are options to add the blogpost to a category, add tags to it and even associate a featured image with this blogpost. These could be considered slightly advanced options so you can skip those for now if you’d like. Just for the sake of exercise you should type a short blogpost and click on the publish button. Once you do that, you will have had published your first post! After you click on Publish, you will see a confirmation at the top of the page and a new link as shown on the following screenshot. Click on that link and you will see your newly minted blogpost. After you click the publish button, you can find your blogpost on this link. Thank you Rick for checking it out. Feel free to pass it on to your friends if they need some help! Correct. That’s how it works for domains. When you pay someone for a domain, you are generally paying them to register it for you but you “own it.” If you want to move it, you can. There are timing restrictions, but you can certainly move it somewhere else. HOW to pic blog domain is very useful. It seems simple tips but those are major to carry our blog forward. Thanks for sharing.